Thousands of conversations about scholarly content happen online every day. Altmetric tracks a range of sources to capture and collate this activity, helping you to monitor and report on the attention surrounding the work you care about. A single research output may live online in multiple websites and can be talked about across dozens of different platforms. At Altmetric, we work behind the scenes, collecting and collating all of this disparate information to provide you with a single visually engaging and informative view of the online activity surrounding your scholarly content. Dig into the data! Our intuitive platforms make getting started easy. 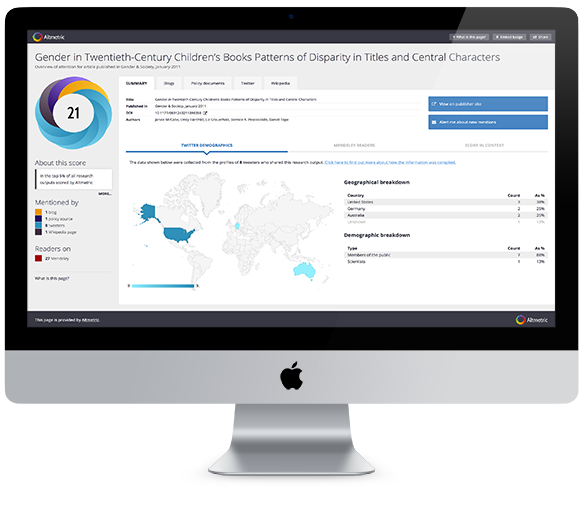 Take a look at the tools and services we offer and find out how Altmetric can work for you.